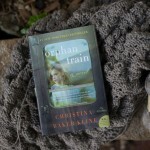 I’ll admit that I like it when my knitting happens to match my book. 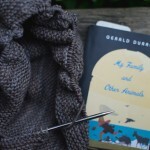 I’m still knitting the same things: my Follow Your Arrow Mystery Shawl, and a Jane hat. This must be the slowest hat brim I’ve ever knit. The shawl is coming along well though, and I am keeping up so far. I can’t believe there are over three thousand other Follow Your Arrow Shawls being knit right now as well! I really love having the clues arrive once per week. 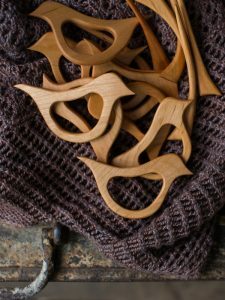 It forces me to schedule out a certain number of rows per day and I like knowing that as long as I continue to keep up, I’ll have a finished project in a few more weeks. I wouldn’t want all of my knitting to be that way, but do like how this is going. I finished reading The Good Earth and started right into the next book in the trilogy, Sons. I think these are books that you are either going to love or hate based on the fact that I had a discussion with a friend last week about how much we love The Good Earth, and then last night I mentioned the book to another friend who expressed that she hated the book so much that she is still trying to block it from her mind. Ha! I bought a new field guide last week, Wildflowers and Plant Communities of the Southern Appalachian Mountains and Piedmont and I actually want to read it cover to cover. Slowly, I guess. There’s a lot of information there. But the organization is fantastic, with plants grouped within the book according to the communities they naturally occur in rather than grouping flowers according to color or other similarities in appearance or family. This guide will help me to learn to identify entire groups of plants and will be really useful when we go hiking and exploring. Thanks, Ginny, for hosting the yarn along. I look forward to it each week. Quick question…I am fairly new to knitting, and I am currently working with circulars for the first time. I have some inexpensive bamboos with a clear plastic/vinyl cord, and I am not liking them at all. The cord keeps twisting and bending where it connects to the needles, and my stitches get hung up on it and won’t slide easily. I have some birthday money that I want to spend on better circulars, what type/brand do you use? Thanks, Ginny. Do you use interchangeable or fixed? Wood or metal? Sorry about all the questions…I’m so overwhelmed by all the options. Thanks, Ginny, that was very helpful information. Just what I needed. I was looking at those stitch markers just the other day, wondering if I should get them. 😉 Have a great day! I’m so excited to watch your FTA shawl. Unfortunately, I won’t be able to start mine for awhile but am excited about when I do have the chance! Yours looks so warm and inviting. Hi Ginny, thanks for the party and I love all of the WIP creations. Have a nice week and weekend. I loved The Good Earth!! I didn’t know there was a trilogy. Thanks for the heads up, I’ll be on the look out for it! I’m doing the Follow Your Arrow project too, after you mentioned it here a few weeks back. I’ve chosen all the lace clues so far but I’m starting to wonder if I should have done the short rows for the second clue. The possible combinations and unusual shaping have me all in a tizzy. I’m going to have to make a second one! I absolutely loved The Good Earth and still have it sitting on my shelf to reread one day. I started Sons, but was very disappointed when I just couldn’t get into the story. 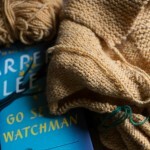 I had to laugh when you said you like your books to match your knitting: I’m the same!! Love when it works out that way. 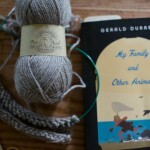 I posted my yarn along twice today on your blog. The first one was linked to last week’s yarn along. The second one will link to today’s post. Sorry about that. I must tell you after seeing your Sunday Sweater, I bought the pattern not really knowing how to knit! I am determined and this is the first sweater I completed. I’m doing another like it and it is going a lot faster. Your pattern is next! I’m reading ‘Ten Ways to Destroy the Imagination of Your Child’ by Anthony Esolen. 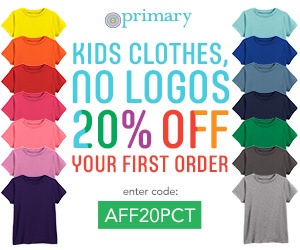 I have now participated in my first ever link party, yey! 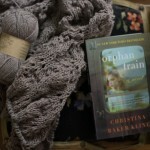 I love the color of your shawl, I´m looking forward to see it done! My mother enjoyed Pearl Buck, but I’ve never tried her. But it is hard to rid yourself of something unpleasant which you’ve absorbed, isn’t it? Still, I can’t imagine her books being that way. A mystery KAL is a fun way to knit! What a lovely color for your shawl! Enjoy your new book. 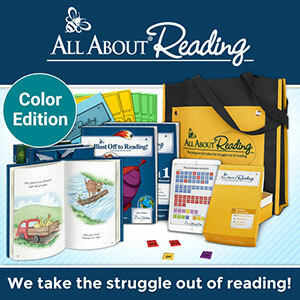 It sounds like it’s packed with info and organized in a practical way. I love the color of your shawl. Thank you for hosting Yarn Along. I read The Good Earth in high school and never knew it was the first of a trilogy. Your shawl is lovely. I like the colorway you picked out. Happy knitting! Beautiful work! Linked via Instagram, #yarnalong. I love the colour of your Follow your Arrow shawl, and that we are both making it but they look so different. I can’t wait to see how they all end up. 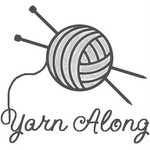 Thanks for hosting the yarn along! … It seems I have done something funny with my link, #59 above. (the one with the red x!) oops. My Nana loved Pearl Buck, and I have never read one of her books, though I have many in hopes that for the sake of my Nana, and making a connection with her those she’s passed, I’ll pick one up. After these books I’m reading I will. Really. I do have at least one other friend who loves The Good Earth, so I may just be an anomaly. Pearl S. Buck is a fantastic writer. I feel the same way about the Follow Your Arrow shawl! Excited about the clues, and excited that ill have a finished project in just a few more weeks! Yours is shaping up so nicely! 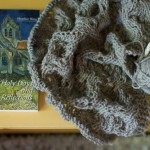 Gorgeous knitting – I still love the color you chose for your KAL shawl. I was hoping that when I looked that book up on Amazon they might have more versions for different regions, since it sounds wonderful, but no luck for me here in the Pacific Northwest! That really is AMAZING that there are so many people doing the Follow Your Arrow myster KAL. I am loving it and I’m so glad you shared it here! It is my first time doing lace and I would have given up during clue 2 had it not been for the wonderful tips and encouragement I found on the ravelry group! Can’t wait to see how yours turns out too 🙂 Just wanted to say hello today- no time to post pics and yarn along, but maybe next week. 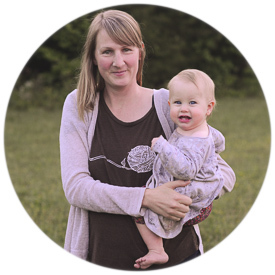 Thanks for being a knitting inspiration- such a needed creative outlet for this busy mama! Sounds like a great way to organize a field guide! I know what you mean about the brim … my sleeve is taking forever (I think I knit the body of the sweater … with 4x the number of sts … faster than I’m making this sleeve … and then I’ll need to do another! 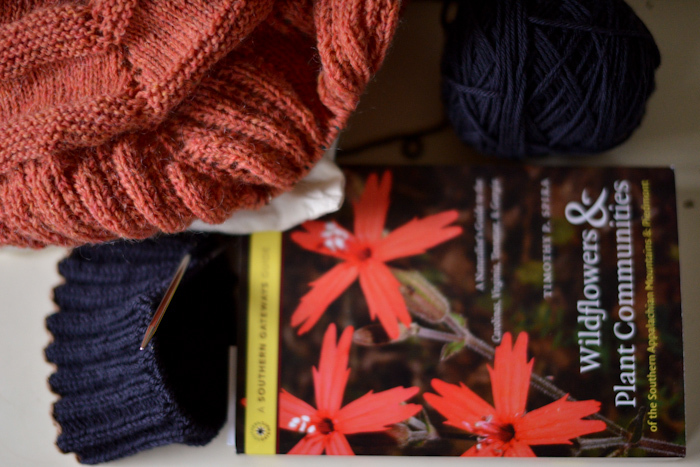 Aren’t you all matchy matchy over here 😉 I think my knit matches my book this week as well, Ah, simple pleasures. Glad you are enjoying the mystery knit along.